How can I open multiple Eclipse workspaces at the same time on the Mac? On other platforms, I can just launch extra Eclipse instances, but the Mac will not let me open the same application twice. Is there a better way than keeping two copies of Eclipse? EDIT: Milhous's answer seems to be the officially supported way to do this as of 10.5. Earlier version of OS X and even 10.5 and up should still work using the following instructions though. This last command will launch eclipse and immediately background the process. Rinse and repeat to open as many unique instances of Eclipse as you want. "Eclipse" is an application downloaded from the Internet. Are you sure you want to open it? Actually a much better (GUI) solution is to copy the Eclipse.app to e.g. Eclipse2.app and you'll have two Eclipse icons in Dock as well as Eclipse2 in Spotlight. Repeat as necessary. If the question is how to easily use Eclipse with multiple different workspaces, then you have to use a kludge because shortcuts in OS X do not provide a mechanism for passing command line arguments, for example the "--data" argument that Eclipse takes to specify the workspace. While there may be different reasons to create a duplicate copy of your Eclipse install, doing it for this purpose is, IMNSHO, lame (now you have to maintain multiple eclipse configurations, plugins, etc?). Now create an alias to that file on your desktop or wherever you want it. You will probably have to repeat this process for each different workspace, but at least it will use the same Eclipse installation. A terminal window will open and a new instance of eclipse will start. Note that if you close the terminal window, the new Eclipse instance will be closed also. Instead of copying Eclipse.app around, create an automator that runs the shell script above. Then you can drag this to your Dock as a normal app. One another way is just to duplicate only the "Eclipse.app" file instead of making multiple copies of entire eclipse directory. Right-Click on the "Eclipse.app" file and click the duplicate option to create a duplicate. then all you have to do is just open the terminal and type eclipse. I found this solution a while back, can't remember where but it still seems to work well for me. ... substituting where your workspace is located. When you launch ProjectB.app it will automatically start with that workspace instead of prompting for a location, and you should be able to run it at the same time as other Eclipse instances with no problem. In Terminal simply paste below line and hit enter ..
After adding the plugin, go to "Run"->"Organize Quick Lauches" and add the external tool config from step 2. Then you can configure the icon for it. After you save that, you'll see the icon in your toolbar. Now you can just click it every time you want a new Flashbuilder/Eclipse instance. If you want to open multiple workspaces and you are not a terminal guy, just locate the Unix executable file in your eclipse folder and click it. Clicking on this executable will open a separate instance of eclipse. 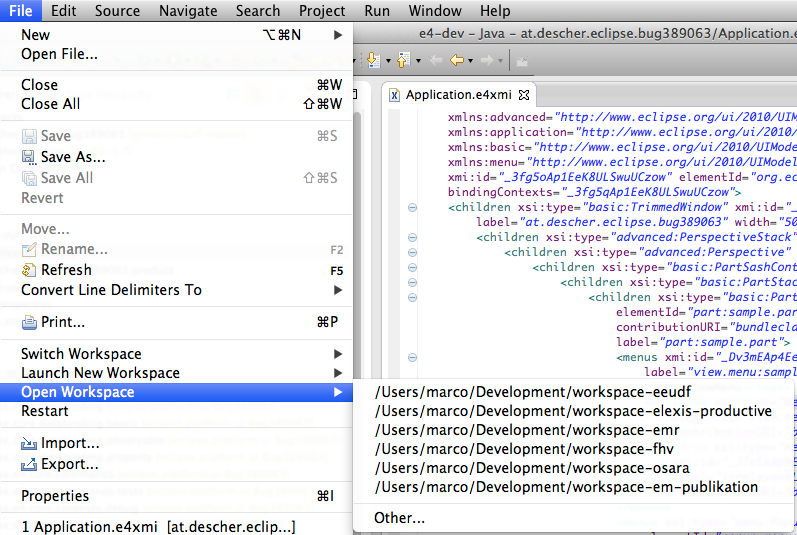 You can create an AppleScript file to open Eclipse with a given workspace. You can even save the AppleScript file as an Application, which is equivalent to creating an alias with arguments in Windows OS. do shell script "open '/path/to/your/Eclipse/installation' -n --args -data /path/to/your/workspace"
do shell script "open '/Applications/Eclipse.app' -n --args -data /MyWorkspaces/Personal"
Press the Run button to check it's working. This script can be saved as such, but I prefer to save it as an Application. That way I can customize the icon by copying the *.icns icon from the original Eclipse.app bundle to the script application bundle. 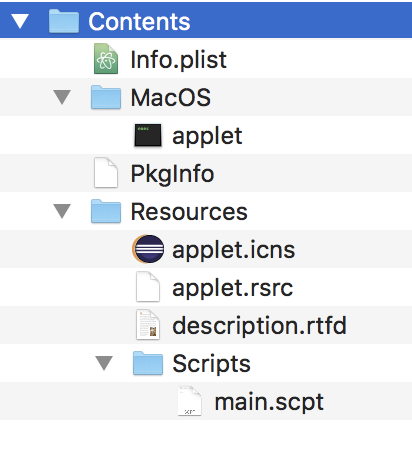 Where "main.scpt" is the AppleScript file and "applet.icns" is the icon from the original Eclipse bundle. This opens a new window and you can then open another project in it. You can use this as a workaround hopefully. It actually allows you to work in same workspace. Not the answer you're looking for? Browse other questions tagged eclipse macos or ask your own question. How do you split and unsplit a window/view in Eclipse IDE?